Joseph M. Lobozzo II, left, was honored July 20 with the NRS Award. RIT President David Munson, right, thanked Lobozzo for his ongoing support. The Nathaniel Rochester Society celebrated its 50th anniversary July 20 and honored Joseph M. Lobozzo II as the 2017 NRS Award recipient. 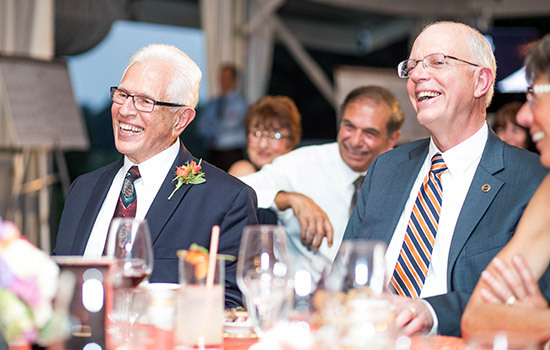 The mission of the Nathaniel Rochester Society is to develop friends and ambassadors to promote and support RIT. The society started after an influential band of RIT supporters led the initiative to move RIT from downtown Rochester to the current campus. Al Davis, then a vice president of the Institute, proposed the formation of the Nathaniel Rochester Society. Several other leaders, including Trustee Gaylord Whitaker, made the proposal a reality. The Nathaniel Rochester Society was officially established on Oct. 29, 1967. Today, NRS members include some of RIT’s closest supporters. NRS comprises more than 650 individuals, including more than 500 RIT alumni. The NRS Award, established in 1972, has been permanently endowed through the generous gift of Mr. and Mrs. Marcus N. Barbour, charter members of the organization. This year’s NRS Award recipient, Lobozzo ’95 (Executive MBA), has served on the RIT Board of Trustees (1999-2013) and advisory boards for the Center for Integrated Manufacturing Studies, Venture Creations, Saunders College of Business Executive MBA program, and several terms on the Dean’s Council for Saunders College. He also served as vice chair of RIT’s Powered by the Future capital campaign and established the Lobozzo Executive MBA Challenge Scholarship. Lobozzo is the founder of JML Optical Industries Inc. 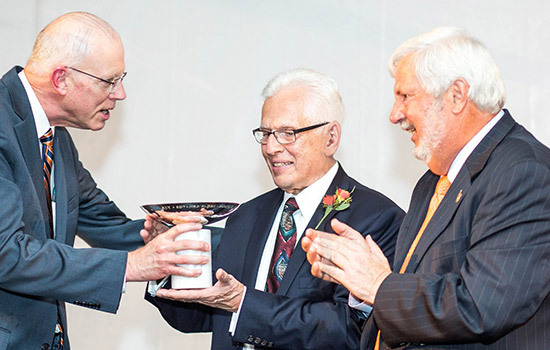 The award was presented by RIT President David Munson and Daniel Tessoni, the Daniel D. Tessoni Endowed Professor in the Saunders College of Business, Lobozzo’s professor in the Executive MBA program and a close colleague and friend of the award recipient.